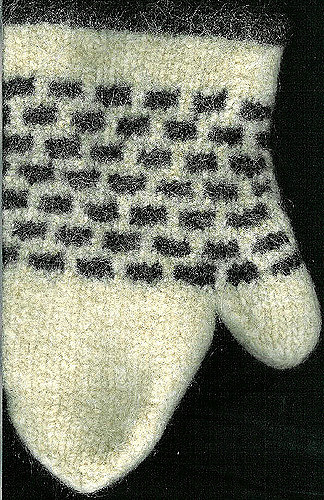 NOTE: Featured pattern picture shows a lightly felted slip stitch design variation from the original solid colored mitt with a CC edging. Yardage requirements include 15 yds. contrast color for edging. You don’t have to use a CC edging, but then you will need more than one skein of the featured yarn. You will need more CC yarn to make the slip stitch variation. I made a pair of mitts from two contrasting colored skeins of Lamb’s Pride Bulky, the 2nd mitt with the opposite colorway (dark with light pattern).